Sattler Avenue is a short, block-long street in the Schiller Park neighborhood on the East Side of Buffalo. 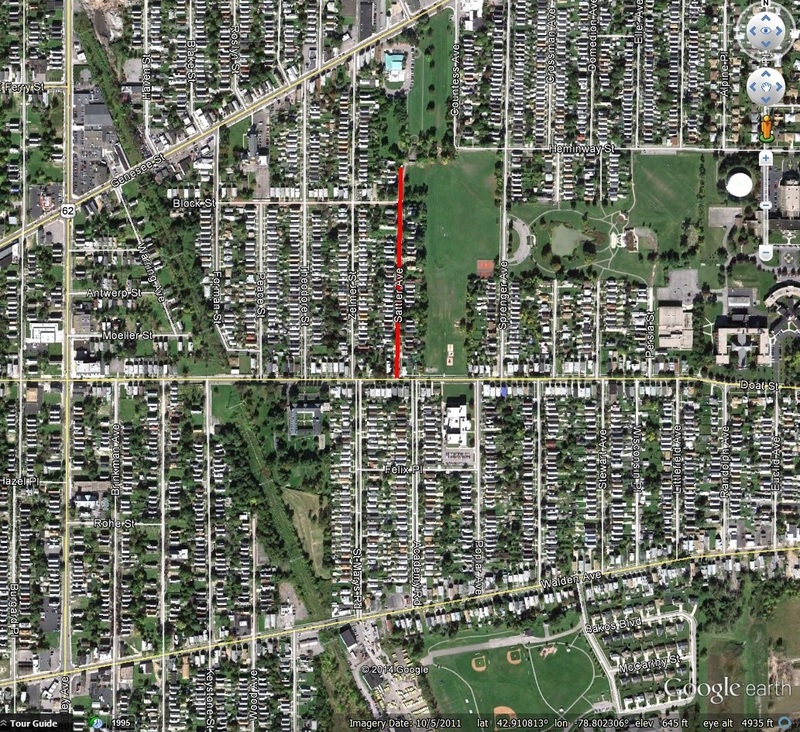 Sattler Ave runs for a block and a half off of Doat Street, where it dead-ends in Schiller Park. The street was originally called “Princess Ave” when it was first laid out. The street is named after John G. Sattler, of Sattler’s Department Store fame. Mr. Sattler’s father, George Sattler, had come to the County from Hessen-Darmstadt, Germany. John Sattler was born in East Aurora, but moved to Buffalo during his early childhood. He attended local public schools and Bryant & Stratton business school. At age 15, John G. Sattler got a job at Eckhardt’s department store on Broadway. His wage was $3/week. His first solo business venture was a one-man shoe store, located only a few feet from what became Sattler’s best-known establishment. John’s mother owned the building; the family lived upstairs so he could work all hours of the day. The store opened in March 1889. He hung a bell at the front door, and they would run downstairs to assist customers and all times. he took pride in customer service and would study the behavior of his customers. If they came in and did not purchase anything, he would ask them why. If their answer was “you don’t have what I am looking for”, he would go out of his way to order it for them. Mr. Sattler purchased properties adjacent to his store as the business grew. The business continued to grow and later include clothing. 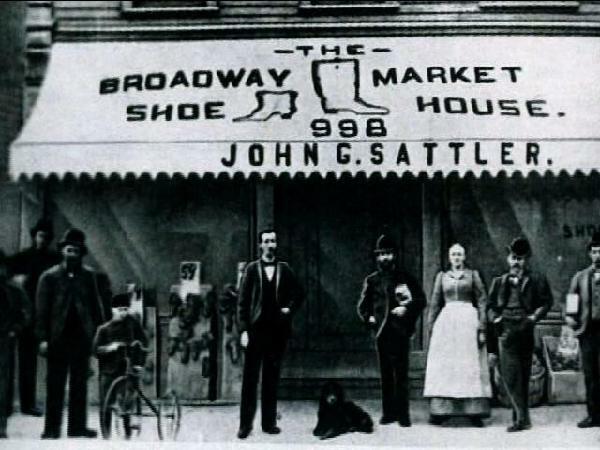 The original address of the shoe store was 992 Broadway. In 1900, a larger, modern building was built, with the address of 998 Broadway. In 1926, the store was reorganized to become Sattler’s Department Store. At Sattler’s Department Store’s peak, the store employed 800 people. Mr. Sattler claimed to know them all by name. Once the store was established in the 1920s, Mr. Sattler allowed his son-in-law, Charles Hann, Jr. to take over the day to day operations. Mr. Sattler then began to work in real estate. Mr. Sattler’s first real estate development was on Sattler Avenue, where he had once owned a summer country home. He saw that the city was beginning to develop towards that direction, so he built houses. The street was formally dedicated as Sattler Avenue in 1904. Mr. Sattler also developed the Kenilworth subdivision in Tonawanda in 1908 following the closure of Kenilworth Park race track. Mr. Sattler’s real estate holdings spread throughout the city – stores, homes and businesses in every section of the City. He also owned and developed properties Tonawanda and Amherst. He owned the Lautz Estate, east of the Village of Williamsville and the Hollywood subdivision, which included Westfield and Ivyhurst Roads in Snyder, and the Tennyson Terrace near transit Road. He built a house for himself at Main Street and Ivyhurst Road in 1919. While many developers of the time in the suburbs were catering to the rich, Sattler built houses for the working class, who desired modest homes. 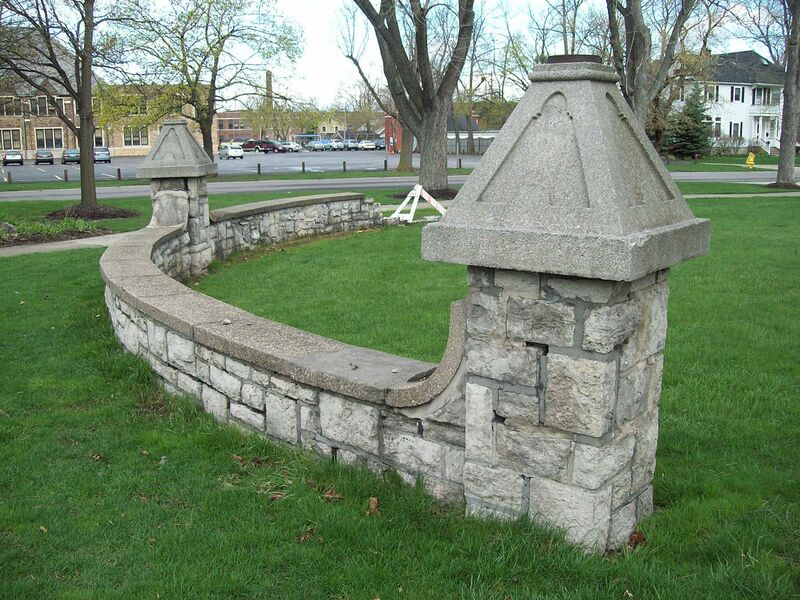 Mr. Sattler is responsible for the entranceways on Main Street at Ivyhurst Road and Westfield Road, which are listed on the National Register of Historic Places. In 1914, Mr. Sattler opened Sattler Theater at 516 Broadway. Mr. Sattler felt there should be a theater on the East Side of Buffalo; however, the theater was considered to be a failure since it was too far away from the theater district and shopping opportunities. 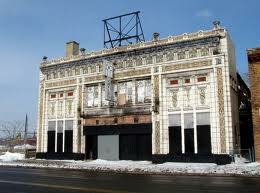 It was sold in the 1920s and became Basil’s Broadway Theater. The theater was then home to a series of religious groups- Muhammad’s Mosque, God’s Holy Temple and Joy Temple. In 1996, the last of the groups left the building and the building was abandoned. Mr. Sattler considered Business School a valuable resource and would select promising young men from his employees and send them to business school on scholarship. Mr. Sattler had two daughters, Doris Sattler and Mrs. Charles Hahn, Junior. Mr. Sattler moved to Ivyhurst Drive in Eggertsville, where he owned seven acres of lawns and gardens. In 1939, he had three canaries and a number of chickens. He became fond of the chickens, and raised them as pets rather than food, and stopped eating chicken completely. Mr. Sattler witness a great change in Buffalo during his lifetime. He is quoted as saying: “I remember when Broadway was a cobblestone street with plant sidewalks on each side of it. 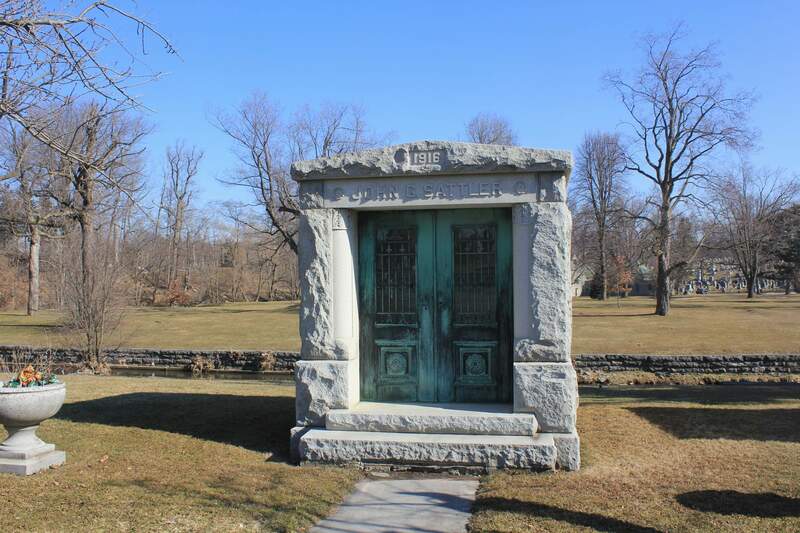 Fillmore Avenue was then a parkway, lined with beautiful trees, and on Gibson Street, just off Broadway, there was a swimming hole.” Mr. Sattler died in 1941 and is buried in a mausoleum in Forest Lawn. Sattler’s Department Store remained in business for nearly 100 years, spreading across the WNY Region. The store continued to grow after Mr. Sattler stepped down and gave the business to his son-in-law. In 1927, Sattler’s hired a buyer for women’s wear, then added men’s boys’ furniture, appliances, housewares and a food market. As more departments were added, they hired an advertising and promotions manager. During the 1940s, Sattler’s was at it’s peak. They had promotional schemes that were considered outlandish at the time. They’d give away cars, they hired high wire walkers. The store would purchase good from a bankrupt sore or a fire sale and pass along name-brand products at extreme discounts for its customers. The store was located outside of the downtown area, so there weren’t theaters, restaurants or hotels to draw shoppers. Sattler’s depended on clever advertising to draw in crowds. In May 1949, they used more than $60,000,000 worth of aviation equipment for an airshow. They won an award that year as the National Retail Dry Goods Association’s winner for best coordinated campaign. The store continued to expand the store at 998 Broadway into the 1950s. In 1954, the company leased the former Jahraus-Braun store at 1021 Broadway to turn it into the Sattler’s Home Annex store. They later added an appliance store at 3610 Main Street in University Plaza. In 1957, Sattler’s opened another appliance store in Hamburg and a trade-in store at 1025 Broadway. In 1961, the appliance stores were consolidated into the Annex Store. In 1962, a new store was built at the new Boulevard Mall in Amherst, and one in Rochester, New York. The Rochester store was only open one year. In 1963, Sattler’s Drugs opened four free-standing stores and added a pharmacy inside each Sattler’s store. Sattler’s celebrated its 74th anniversary with a motorcade from City Hall to 998 Broadway and a ribbon cutting ceremony with company officials and Mayor Chester Kowal. In 1965, the company opened a warehouse, home furnishings and food store in a former plant at 1803 Elmwood and Hertel Avenue in North Buffalo – calling it Sattler’s Wonderful World of Foods and Home Furnishings City USA. The store was called ” a giant step forward in space age selling, bold and imaginative merchandising”. 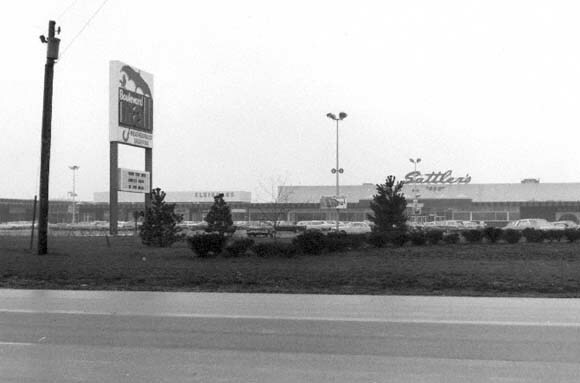 In 1969, Sattler’s opened a new store in the new Seneca Mall in West Seneca. Both the Boulevard Mall and Seneca Mall locations were considered to be more upscale than the other stores, different than what the average Sattler’s customers expected. In 1972, the Thruway Plaza store closed, mainly due to its proximity to the Seneca Mall location. In 1973, Sattler’s moved downtown when Kobacker’s closed in teh Main Place Mall. In 1979, the store returned to Cheektowaga into the converted Thruway Plaza, which was now the Thruway Mall., opening a “specialized fashion store”. The 998 Broadway location filed a going out of business sale in March 1981. In January 1982, the Thruway, Seneca and Main Place Mall Stores closed as part of bankruptcy proceedings. The last remaining store was at the Boulevard Mall, which closed by December 1982. The 998 Broadway building was demolished in 1989. A K-Mart was built on the site, but that also closed shortly thereafter. For more on Buffalo’s retail history, be sure to check out Mike Rizzo’s book: Nine Nine Eight: The Glory Days of Buffalo Shopping. To read about other street names, check out the Street Index. Rizzo, Michael. Nine Nine Eight: The Glory Days of Buffalo Shopping. Lulu Enterprises: Morrisville, North Carolina, 2007. When my dad still lived in Clinton-Bailey area, going to school on the GI bill after Korea (mid 1950s), Sattler’s often picked up job-lots for their promotions. One of the most surprising: a cache of Enfield rifles (dating back to WWI) which they sold at bargain-basement prices…hard to fathom!